We get an EXTRA EXTRA EXTRA late start picking up Lizzie at her new REI job at 2pm and I exceed the designated speed to get us to the Mirror lake trailhead at windy pass. This is a section of the Pacific Crest Trail that I've been on before and it's a wonderful collection of big Douglas fir, beautiful little creeks and nice views. our return will be on the PCT which should be easy to follow in the dark if and when it comes to that. Seattle is just coming off a week of 90+ degree weather and today they are they are predicting rain. We're ready for that too and no sooner do we hit the trail and it does... rain. Not badly though but it is clear from the dripping emerald green everywhere that it had been raining earlier too. It doesn't last long and leaves the wild flowers glistening. it does lose elevation. Over the next quarter of a mile we get some beautiful views of your goal - Tinkham hanging like a castle in the sky. At the end of this quarter mile is a fork marked by a large cairn (elevation 4280). We follow this little trail up for a half mile to the saddle you can see above you (elevation 4730). Here the trail splits in 3. Right goes to Silver, middle to Abiel, and the left to Tinkham. The Tinkham trail gains elevation a little more seriously here, following the right side of a ridge that runs to the west summit. The trail isn't the most distinct but the direction is obvious - up. Also, as long as you continue to see signs reminding you not to trespass into the Cedar River watershed you're going the right way. At about 5:30 PM we reach the summit rocks. There are a few spots that look like they might require some major scrambling but that just means that we've wandered off the path. Stay on the path and the top is an easy but occasionally steep and exposed walk. Forty minutes after leaving the saddle, we reach the top. It's blustery, sometimes foggy, only occasionally offering views that come and go but the north edge is a spectacular vertical drop! We find a sheltered spot and celebrate with food. It's cold but Joan had the great idea to bring hot chai tea which really hits the spot. We sup and discuss out options. I suggest that we NOT go back the way we came in. The trail up from the saddle is guaranteed to be a knee breaker plus it's slippery and muddy. The ridge to the east summit looks really cool and appears to have a well traveled trail. From here we can find the descent to mirror lake where we'll reconnect to the PCT. I estimate it'll add a mile and a half "worth of adventure" to our trip and probably guarantee we'll come out in the dark, but it will theoretically be easier. We all agree. The ridge walk is indeed easy. The weather is getting a little better and there are lots of great views. It's about a half mile to the east summit where the descent trail continues southeast through a big talus field. We keep leftish heading toward mirror lake. when we re-enter the forest we have a little trouble finding the trail but once found it's easy to follow (accompanied once again by the ubiquitous "no trespassing" signs). In an hour and half we reach Mirror lake, circumnavigate counter-clockwise, find the Pacific Crest Trail and begin the hike out. Joan has some knee problems that are acting up and we move pretty slow, reaching the car at 10:40 PM. I highly recommend this hike - it is gorgeous and doing it as a loop minimizes going over the same ground twice. We took 7 hours but I'm sure it could be done comfortably in 6 without any hurry at all. 8.1 miles round trip, 2600 feet. Drive I-90 to Snoqualmie Pass, take the Hyak exit and drive through the Hyak ski area slash development area. Stay on the main road and drive south past a sewage treatment plant, past Lake Keechelus for a total of 5.4 miles to reach Windy Pass (elev 3830) and the Mirror lake trailhead (same as the Pacific Crest Trail). Follow the PCT 2 miles (.25 miles past the 'S' turns where you lose elevation) and fork uphill (at elevation 4280) to the saddle (4730) between Silver, Abiel and Tinkham peaks. At the saddle there are multiple forks - take the left most to the west summit of Tinkham (5390). 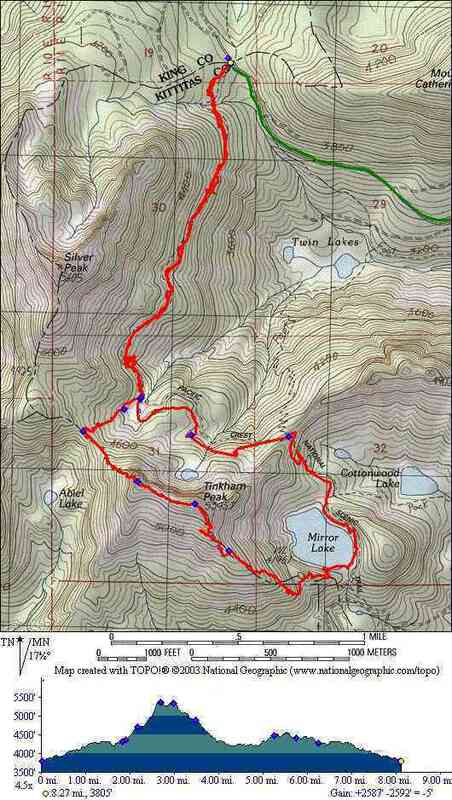 Follow the ridge to the east summit (5380), then descend on a southeast line to Mirror lake (4200). Here you can regain the Pacific Crest trail (northbound) and walk out (3.5 miles). Total 8.1 miles round trip, 2600 feet. Note - there's an alternative approach to Tinkham that I have not done where you hike in from a trailhead southeast of Cottonwood lake (which is southeast of mirror lake).